Prof. Katherine Kim and graduate student Hoejeong Jeong attended COMPEL 2018 on June 25-28 in Padova, Italy. 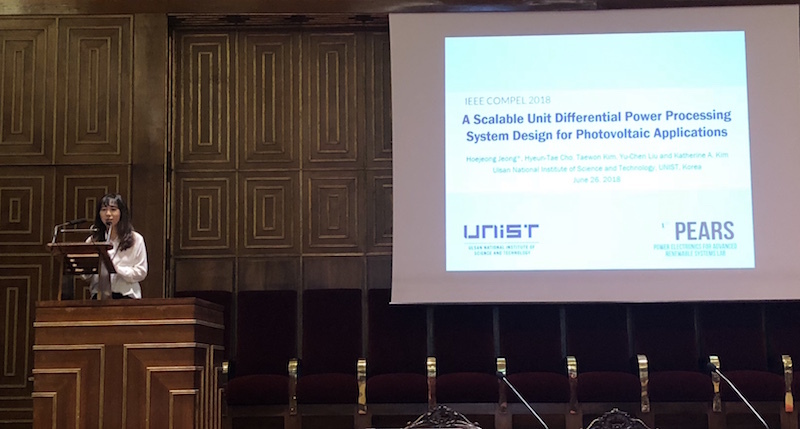 On Tuesday, June 26, Hoejeong Jeong presented the paper on “A Scalable Unit Differential Power Processing System Design for Photovoltaic Applications” at the Galileo Galilei Main Hall in Palazzo Bo. A job well done presenting important research on new PV differential power processing applications. Hoejeong Jeong also received a Student Travel Grant to attend COMPEL.